Cardinal Gates Stairway Special Gate provides maximum protection for your little ones when they are playing. This baby gate is designed to provide maximum safety at the top of the stairs. However, it can also be used in other areas. The latch is designed in a way that ensures that your kids will never be able to open it. You will therefore be assured that your children are safe at all times. This gives you peace of mind so that you carry on with your daily routine. Its door opens away from the stairs to ensure that it will never open despite the amount of pushing it receives. The door can be set to open in both directions when the gate is mounted in other areas like the kitchen or living room. The door only opens in one direction when the gate is mounted at the top of the stairs. The latch does not have any parts that children can swallow or put in their ears. It comes with an optional stop bracket that prevents accidental opening over a stair way ensuring that your children will always be safe. It has a height of 29.5 inches which means that your kids will not be able to jump over it. The width of the gate can be adjusted from 27’’ to 42.5’’. This makes this gate very versatile as you can use in a wide range of areas. One of the most unique aspects of this baby gate is that you can be able to mount it at an angle of 30 degrees. This allows the gate to fit perfectly and securely at the top of the stairs. Mounting it an angle does not affect the effectiveness of the latch. The gate is suitable for grandparents or other individuals who are not able to move their feet correctly since it has no bottom piece at the door that can trip them. It is constructed of aluminum making it durable as it will never rust. Aluminum also makes the gate light and you will therefore not have to worry about breaking your back when moving it. It has a powder coated finish that enhances its durability and makes it easy to clean. If you intend to use the baby gate outdoors you can buy a stainless steel hardware pack that is sold separately. Operating the latch of this gate can be tricky. However, it is better you spend some time operating it than risk having a simple to operate latch that will make your kids to fall down the stairs. 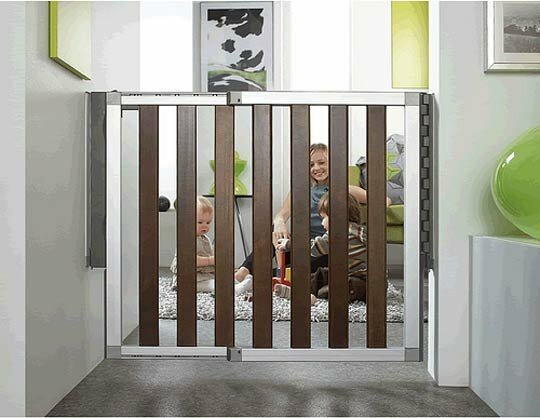 This baby gate provides maximum safety for your little ones.